As we confront today’s child-killing Gates of Hell under the power and promise of Christ, we labor alongside others whose definition of Christianity looks different from our own. Some of our friends have become very offended at what they consider to be idolatrous prayers and practices of some of our co-laborers. A Samaritan rescues an injured man who had been shunned by a priest and Levite. This offense of idolatry may seem to overshadow the offense of abortion, causing our friends to focus instead on attacking the religion of our co-laborers as another “Gate of Hell.” This problem often weakens or even destroys anti-abortion efforts. If the Church is to faithfully confront the Gates of Hell, we must indeed first be sure to properly (and fully) identify these gates. Ignoring one gate while confronting all others is likely to prove to be futile in the long run. Jewish leaders did not limit the concept of the Gates of Hell to Gehenna; the burning of children there only provided the most obvious, disgraceful example. Idolatry and false religions were represented in Scripture as snares which led the nation of Israel on the pathway to child sacrifice (Psalm 106:36-39), along with sexual perversions (Ezekiel 16 and Ezekiel 23). People worshipped idols because of the perceived perks they would derive from such idolatry, such as economic benefits. “There is a way that seems right to a man, but its end is the way to death” (Proverbs 14:12). So even well-intentioned people (when they seek to follow their own agendas) often find themselves on the pathway to Hell. Clearly, then, true religion is the Way of Life, and false religion is the way of death (a gate of Hell). But throughout history true religion has often been mixed with elements of false religions. In Jesus’ days, the Samaritans were a prime example of such a mixture (in terms of both their genealogies and their beliefs). A Samaritan woman was surprised by the respect with which Jesus treated her (John 4:9), knowing that Jews considered Samaritans to be idolaters. Gently but boldly confronting her sin and her false beliefs, Jesus did not fail to affirm her proper beliefs (John 4:21-26). 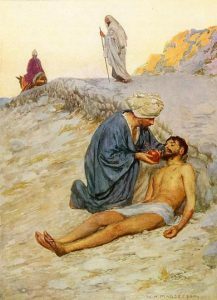 But when an expert on Biblical law asked Jesus how to inherit eternal life, Jesus used the behavior of a compassionate Samaritan as an example of how to “love your neighbor as yourself” (Luke 10:37), challenging the Jewish man to follow the Samaritan’s example (which no doubt shocked and offended many “pure” Jews). Before she met Jesus, the Samaritan woman was on the pathway to Hell, but Jesus considered the behavior of the Good Samaritan to be characteristic of the Way of Life. So we must follow the balanced example of Jesus when discerning whether or not to confront syncretistic churches as Gates of Hell. In truth, can we identify any church today which has not in some way become tainted with false religion? Therefore, if we acknowledge the logs in our religious eyes, we must be careful when seeking to remove the specks from the religious eyes of our Christian brethren in other folds. Nevertheless, we can and should engage in healthy debate with other Christians, with the goal of “iron sharpening iron” in the heat of the friction, while avoiding any tendency to ignite the rhetorical fires of Hell against God’s sheep. If the priest and the Levite in Jesus’ parable had decided instead to start helping the injured man, would it have been appropriate for these two Jewish leaders to work alongside this hated Samaritan? Jesus’ positive portrayal of the Samaritan leaves us with no other option but to assume that Jesus would have advised the priest and Levite to cooperate with the Samaritan. So how then can we know where to draw the line? How do we discern which religions are truly “Gates of Hell” we must confront? Jesus Himself is the dividing line, and He Himself set the example. Those who characterize the healing power of Jesus as demonic are truly His enemies (“he who is not with Me is against Me,” Matthew 12:30) while we should not fight against other groups who confront the demons in Jesus’ name (“he who is not against us is on our side,” Luke 9:50).